For organizations hoping to tailor their incentive and engagement programs for employees and customers, the debate concerning the generations can be confusing and even overwhelming. Like economists, no two generational experts fully agree on the description for each generation, a truth that is well-documented both in the expert interviews conducted for and summarized in this paper, and in the dozens of papers, books and articles referenced throughout. In particular, there is little consensus where traits and characteristics of the generations are concerned. And most generational experts suggest that what differences do exist, result from a combination of the time frame within which a person is born and the stage of life in which they reside. These factors influence their motivations at work and their desire for certain goods and services (or rewards) and other preferences. Some experts argue that the formative life experiences shared by each generation make them unique and stay with them from youth through retirement. Others ascribe less importance to a person’s generation and more to their life stage—i.e., whether they are married or single, have children at home, make mortgage payments or are approaching retirement, etc. In catering to consumers, leading organizations are beginning to leverage increasingly sophisticated data algorithms to gain far more accurate insights into individual preferences, motivation and engagement. In the near future, most or all organizations will do the same for employees as well, obviating the need for the broad, educated guesses based on generations or life-stages. Until then, and despite the differences of opinion referred to above, organizations should seek to understand the age and life-stage demographics of their workforce and the broad preferences and motivators associated with each. Doing so will not provide knowledge of the specific drivers for each employee or customer, but it will deliver a basis on which to approach people generally—whether employees or customers. This is a useful, if imperfect approach to consider in designing reward, incentive and recognition programs for employees and marketing and incentive programs aimed at consumers. As of the latest data from the US Bureau of Labor Statistics (BLS), the United States civilian workforce—age 16 and above—is about 157 million people strong and growing (Figure One). Within the workforce, four distinct generations currently work side-by-side, with a fifth generation set to enter in 2016. The question for executives, supervisors, business owners, and for others concerned with managing and motivating the workforce—or selling more products and services—is, does it matter? Are there sufficiently consistent and significant enough differences between the generations that organizations can justify time and money spent studying their workforce demographics and understanding the general differences between the generations? Or, is the study of the generations a red herring—a waste of time? Beyond gaining an understanding of the demographics of the workforce, should organizations manage and motivate workers and market to customers from the three generations differently to the extent of tailoring programs, products, services, rewards, incentives and work conditions in an attempt to better engage employees or consumers from the three different generations? This paper attempts to help organizations answer these questions. Specifically, by addressing the challenges in motivating and engaging the three generations of workers and consumers through reward, recognition and incentives programs, and to a smaller degree, through tailored consumer products and services. – Barford & Hester, 2011. The extensive and growing literature about generational differences provides dozens—perhaps hundred — of definitions of the three main generations at work today. Google searches on “Millennial” and “Generation Y” yield more than 150 million results, while a search on Generation X returns 149 million more. Most offer descriptions and many provide tips on how to manage or market to the various generations. Generational definitions usually start by describing the age parameters of each cohort. Despite many differences, most experts agree on reasonably similar age ranges—within 3-5 years at either end—to classify the various generational cohorts. For the purposes of this paper, a range of definitions from eleven credible sources was used to find a mid- range estimate for each of the generations (Figure Two). The age ranges of the three generations opposite closely reflect most organizations’ definitions—particularly pertaining to those raised in North America or Western Europe. This definition also carries the advantage of examining three cohorts of roughly the same duration (17-19 years). Unfortunately, a common definition of the generations becomes much more elusive in the statements, characteristics or stereotypes ascribed to each. People born in the same generation, in similar socio-economic conditions, with exposure to similar media outlets, encounter, to some degree, shared experiences as they come of age, especially those born in the same country or continent. They might, therefore, share similar perspectives throughout their careers and lives. To the extent that employers, providers and incentive program designers can gain a better understanding of how, if at all, generational cohorts should be managed and motivated using the significant perspectives they may share in common, better decisions might be made across a range of factors aimed at motivating individuals. Without question, Tapscott’s “Digital Natives,”16 in general, demonstrate more comfort with social technologies than other generations. This is so because it is part of their natural environment, especially for late Millennials born in the 1990s, who have never known a world without the Internet and social networks. with the web, social media and mobile technologies, “digital immigrants,”17 who spent their formative years without the same tools may be less comfortable and proficient with social technologies by comparison. In theory then, Millennials take to the technology naturally where everyone older has to adapt. Logically, where this is true, there are implications for both employers and providers of products and services. Like Generation X, Millennials have learned from the fate of their parents. They don’t count on employers or the government to take care of them. They may agree that an employer for life is a nice concept but they harbor no illusions as to the probability of staying with one employer for a long period of time.22 Similar to Gen X before them, Millennials seek constant skills building and personal development opportunities because they place little faith in anyone else managing their career and they know that to achieve their goals, they must keep their skills razor sharp. The fact that some Millennials may feel disadvantaged, according to recent Pew research, might contribute to their lower overall levels of trust in people in general, compared to the other cohorts.27 This is another potential area of differentiation between the generations, however, there appears to be no general consensus among generational experts on this characteristic. Between most descriptions of Millennials, there is considerable conflict and contradiction in the variety of attributes attached to them by experts. So many other contradictions and myths describe the generations that it is difficult to sort through and determine consistencies beyond those listed above. Yet at least a few consistencies emerge among the more thoughtful evaluations of Millennials and other cohorts. For Generation X, however—which often gets short shrift compared to Baby Boomers and Millennials, true distinctions are even harder to come by. Depending on how they are defined, Generation X stands out as a smaller generation than either the Boomers before them or the Millennials after. This size imbalance may be responsible for the notion that Xers haven’t shaped the workforce and society in their image as Boomers did and Millennials are expected to. However, Xers have formed unique perspectives and attributes in other ways. Most generational experts agree on a few truths about Gen X. Namely, Generation X came of age at a time when dual income families and divorce rates were sky rocketing.35 Xers weren’t told they could do or be anything they wanted, at least to to the extent Boomers and Millennials were. They saw their parents less because, in many cases, their parents were hard-charging Boomers working long hours to make a difference and get ahead. Generation X is more independent than other generations because they learned to take care of themselves as “latchkey kids”36 at an early age—letting themselves into their homes, making their own lunches and dinners, and doing their own homework, for example. Perhaps more profoundly relative to work attitudes, Generation X was the first to witness the breakdown of the compact between workers and employers during their formative years, and also, the breakdown in the sanctity of marriage. Many saw their hard working, loyal parents downsized and laid-off after years or decades of service to an organization. Others lived through their parents’ divorces, and many experienced both. These factors, and perhaps a few more may have disillusioned the Gen-Xers out of proportion to the generations before and since. For example, the combination of accelerating housing and education costs through the 1980s and 1990s, incidents such as the “Tainted Tylenol” scare,37 and having to contend and compete with hard- driving Baby Boomers. These experiences, it is widely believed, have contributed to Xers distrust of employers and institutions in general as they came of age and even now in the workplace and marketplace. As adults, Gen Xers are, not surprisingly, independent and generally more likely to prefer to do things by themselves than work in teams. All age groups value autonomy but Xers even more so. They are more likely than Boomers or Millennials to appreciate working alone and are less attracted to small talk or office gossip and politics than other generations. to their love of autonomy. Like Millennials and Boomers, Xers value the opportunity to work remotely. Boomers were more intensely parented than generations before them. The widely popular advice of pediatrician Dr. Benjamin Spock during the 1950s and 60s influenced many parents to praise their children more, listen to them carefully, and restrain themselves in their use of corporal punishment.44 Boomers were also born into one of the most optimistic periods in US history. After WWII the economy grew rapidly, technology and medicine brought vastly improved lifestyles, progress in science, including space travel, created an aura in which anything seemed possible. Yet Boomers also came of age under the threat of nuclear annihilation, and through the Vietnam period, the Civil Rights movement, Rock n’ Roll, and the Peace Movement. The societal abundance, achievements and challenges of America today are largely the doing of the Boomers. Given the events that occurred in their era, Boomers are said to be the most idealistic of the three generations.45 While Millennials also share this trait, Boomers are, relative to Millennials, unrestrained idealists (and remain so relative to other generations in their 50s, 60,s and 70s). Yet, despite the influence of the peace, love and hippie movements, Boomers are believed to work harder—or at least longer— than Millennials or Generation X,46 putting in punishing hours and working overtime to make their organizations and the world a better place. It is said that Boomers live to work, they seek advancement and status, they want respect and they expect others to pay their dues. Boomers report that they want workplace flexibility, including the opportunity to work from home. At the same time, Boomers are often the least comfortable with the notion of remote work and flextime and may need more coaching, training and communications than Millennials or GenX. 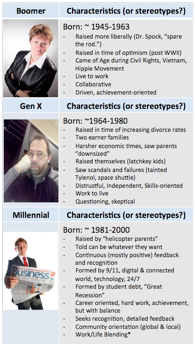 Many generational experts place Boomers closer in their values and characteristics to Millennials than Xers. But Millennials share characteristics of both Boomers and Xers (Figure Three). 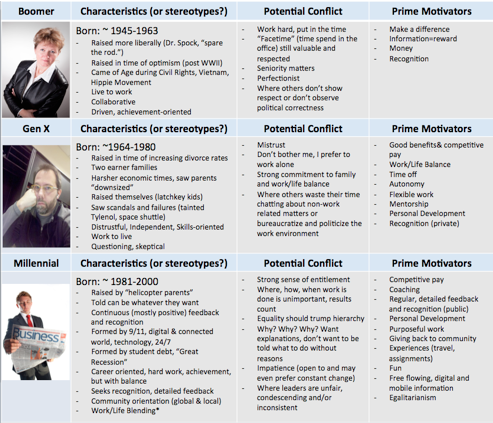 Ultimately, and as the descriptions above have attempted to define, there is some degree of consistency among the experts in their various characterizations of the three main generations in the workforce. Yet, at the same time, there is far more disagreement and inconsistency in how experts, observers and others define the generations. Figure three attempts to capture the majority—if not the consensus—view of the basic, general differences between the generations. or providers of products and services? Are the differences between the three main generations at work merely interesting or significant enough to spend time and resources analyzing them and designing programs to cater to workers or consumers by generational groupings? Part Two addresses these questions directly. More than 150 years ago, the editor of Le Figaro, a French newspaper, said (translated) “The more things change, the more they stay the same.”47 Many argue that there are no generational differences, just differences and preferences that can be attributed to stages of life. Others insist that the distinct and communal events that impacted us as we came of age define us for the rest of our days and cause us to view the world in a way that is unique to our generation. (For a short synopsis on the foundations of generational research, please see Appendix B). The quotes above remind us that generations of youth share many things in common. From idealism, optimism, and “the arrogance of youth,” to concerns about establishing a career and experiencing a range of work, people, and adventure before settling down. A range of research over the past several years also points more to the similarities between the generations than the differences. Of important note, PwC’s findings can only be extrapolated to professional services organizations with workforces heavily comprised of college graduates, many with advanced degrees. Overall, only 47 percent of the US Millennial workforce over 25 years of age possesses a college degree.54 It is safe to suggest that a Millennial with a college degree has more in common with a Gen X college graduate than with another Millennial who didn’t attended college. Despite findings such as these (which, it must be said, represent the very tip of the iceberg) there are many experts who, nonetheless, advise organizations to invest time and resources in knowing and understanding the demographics of their workforce (and certainly, their customer demographics). They argue that only with this knowledge can programs, products and services be designed to appeal to the members of various generations, and, by inference, that appealing to the various generations is a worthwhile strategy. Such programs include recruiting, on-boarding, development and training, and motivational efforts aimed at increasing employee engagement, performance, and retention. Similarly, businesses that understand the demographic makeup of customers and consumers can, according to many generational experts, craft products and services that should boost sales across each generation. And so the debate rages on. However, no one—not even the most fervent believers in generational differences—suggests that every member within a generation is the same or similar in their behaviors, values and preferences. Rather, generational experts argue that an understanding of the generations can provide a useful framework for making broad and general decisions about groups of people, and a means to be aware of employee and customer differences. Whether the similarities and differences are significant enough to warrant special attention, however, is, again, the question with which organizations must grapple. After all, designing tailored programs, products, benefits plans, services and rewards takes time and costs a great deal of money. Organizations might conclude that generational differences don’t matter but differences in stage of life or lifestyle do. If so, the actions they might take are much the same. Indeed, commercially at least, providers of products and services ranging from cars to financial planning have long catered to customers at various stages in their lives—minivans for young families and retirement plans for aging workers, for example. Nonetheless, one can argue that consumer products for generational cohorts are actually aimed at age groups. Beyond the press releases, few products appear to be truly tailored for a specific generation for generational reasons—one that is designed to follow a generational cohort through its life stages. To illustrate, if a 2015 “Best of the Beatles” album were released today, it might well generate more sales among Baby Boomers that among Millennials. Yet the reasons may have more to do with the Beatle’s traditional fan base and nostalgia than anything to do with the consistent, shared values, if any, Boomers have carried with them throughout their lives. The recent trend among hotel chains to launch youthful brands to attract Millennials is especially interesting.65 Just as Millennials are expected to constitute half the workforce within a few years, they are also expected to account for half of all business flights.66 Hotel executives and spokespeople may announce that the hotels are aimed at Millennials but, as above, do they really mean youth? Do the hotels expect that as Millennials become middle aged and then older workers they will still seek out hotels designed for Millennials? Or will Millennials begin to prefer what we now label “traditional hotels” as they age? Put another way, do Millennials with children prefer “Millennial hotels” or suite hotels with reasonable rates? It is, at best, unclear whether common events, no matter how profound, can shape the worldview of tens or hundreds of millions of people for the rest of their lives. It is even more difficult to conclude that if generations act similarly or share preferences in some respects that it is due to shared formative experiences rather that their age and stage of life. Questions about the real and significant differences between generations are important because if one believes that generations keep certain characteristics, world views, preferences, and values throughout their careers and lives, it might be possible to predict what will most appeal to them and motivate them as they age. If so, examples that support that notion are either non-existent or extremely elusive. Conversely, there are abundant examples of products, services and programs aimed at employees, consumers and citizens at various life stages. As the Millennial generation approaches and possibly surpasses fifty percent of the working population in the coming decade, they will dominate in much the same way as Boomers do today—what’s best for them is likely to become what’s best for eveyone else. If so, employers and providers may second guess expensive programs aimed at small segments of the workforce, even if they do believe in significant generational or life-stage differences. Whether due to generational differences or lifestyle and life-stage preferences, people express interest in a wide range of rewards, incentives and recognition—one size very definitely does not fit all. At the same time, some elements of motivation are more or less universal. The “pat on the back” form of recognition, including a sincere thank you, is thought by many to have universal appeal. Even in those situations, however, generational experts are quick to point out the differences. Baby Boomers, many say, appreciate formal recognition in front of teams or groups. Millennials, it is said, enjoy the same but prefer it in the spirit of fun, with less formality and more frequency. Moreover, Millennials aren’t satisfied with a quick thank you, they want specifics. Gen Xers, on the other hand, appreciate the recognition but prefer to receive it privately or just within their small group. The point is not to discredit legitimate research and survey findings but to emphasize the complexity of generalizing any group of 80 million people (in the US alone) and attempting to design any sort of program around them on the basis of generational differences alone. The truth is, of course, that there are some Boomers who plan to work until they drop and others who plan to retire as soon as they can. The motivation for either course of action is broad, varied and subject to abrupt change under the right (or wrong) circumstances. Coca-Cola, the researchers say, appeals to the former with in its Coke commercials featuring “scenes of people spending time together.” While Diet Coke commercials feature “pop stars and incredible personal feats.”78 For reward and incentive designers, this might mean that a range of options should be offered to appeal to all generations. For example, an incentive travel experience might facilitate a range of activities, from the highly casual and laid-back to the outrageous and energetic, with many options in-between. For Generation X, even more of the many motivational drivers shared by Millennials and Boomers apply. At the same time, most observers believe that while all workers desire training, Xers place more value on personal development and opportunities to build their skills than Boomers or generations before them. Xers, it is argued, are constantly concerned with building their resumes because they don’t expect to stay with one employer for a long time. This is consistent with generational theory that would point out the turbulent economic conditions and mass layoffs that occurred during their formative years. Generation X is also said to demand a greater degree of proof that a reward or incentive is what it purports to be. Experts recommend that you “ensure that you don’t make promises that you can’t keep”80 to Xers in particular. Where Xers are invited to events, they may seek meaningful information from knowledgeable people more so than other generations. In other words, the brochure or sleek corporate video may not cut it with many Xers, they might prefer the detailed product specifications and the raw YouTube video made by a regular employee or customer, for example. Like Boomers, Xers appreciate recognition but prefer it be delivered without fanfare—privately in most cases. And if a tangible reward is offered, time off work is likely to garner a better response than cash, merchandise or a plaque/trophy. Xers may be more committed to the environment than any other cohort, so “green” related rewards and incentives might be appropriate. As with any generation, the prospect of a sabbatical, especially a paid sabbatical, should be exceptionally well received among Xers. 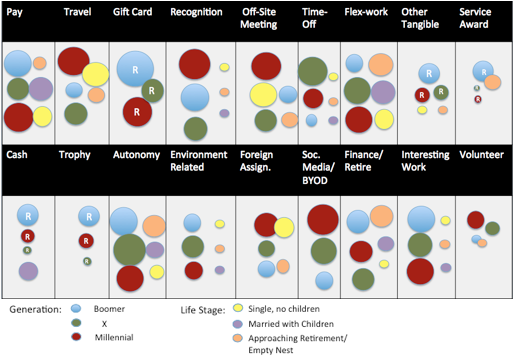 Generation X are said to demand work/life balance to a greater degree than Boomers and Millennials.81 However, some research counters this belief, indicating instead that Xers are the least concerned of the three generations where work/life balance is at stake.82 Also similar to Boomers and Millennials, Xers seek workplace flexibility, after all, they may be as squeezed today by caring for two generations as Boomers are purported to be. In its 2015 study on the generations, IBM found that despite the belief that Millennials seek the most frequent recognition among the generations, “They are no hungrier for accolades than Gen X employees.”83 Like, Boomers and Millennials, IBM argues, Xers prefer face-to-face experiences to virtual ones. However, they might go either way when it comes to preferring casual or extreme experiences. As above, a tremendous amount has been written about how Millennials differ from the rest of the workforce, yet upon analysis, the similarities far outweigh the differences. For many, the overriding dissimilarities boil down to use and comfort with technology—particularly social technologies. This might translate into policies or rewards that allow and encourage employees to use social media at work. For organizations and providers this also means Millennials should be looked at to understand where social technologies are headed; after all, Millennials will drive the evolution of social technology for at least the next decade. In doing so, they will shape the way the rest of the generations use social technology at work and at home.86 For providers hoping to sell to Millennials, it might mean providing free wifi at their locations (or sponsoring free wifi at others) and ensuring that their own digital presence is up-to-date, mobile and useful. The survey also revealed that Millennials are more interested in loyalty programs than other generations (even though they use them slightly less at this stage).88 However, Millennials expect to earn enough points to acquire a reward much faster than other generations and they are more likely to research the actual value of rewards they receive than others. The combination of time off to contribute to the community could have great appeal to Millennials especially, and like Generation X, large majorities of Millennials and Boomers want flexible work options including options to work remotely. Sodexho research states that Millennials want awards, certificates and “immediate tangible rewards,” 92 while a great deal of other analysis suggests that experiential rewards are far more impactful for Millennials than cash and other tangible incentives. Millennials preference for face-to-face encounters and their desire for travel and experiences could make business travel and offsite meetings particularly rewarding for Millennials, especially where it includes an element of recognition, i.e., offsite meetings that include and recognize them as high performers. Of course, Millennials are often derided for having received awards and recognition just for showing up—whether placing first or last in a race, for example. To the extent this is true it might also contribute to Millennials’ preference for frequent (positive) feedback. As above, Millennials may be more driven than prior generations by their belief that Social Security will either run out or be insubstantial when they retire. Only about one in twenty count on getting the same level of benefits as retirees receive today.97 For reward and incentive designers, understanding Millennials’ insecurities in this sense might help them to create innovative programs such as retirement planning tools, information, and seminars aimed at workers still in their twenties. If Millennials are aware of their disadvantages around savings and retirement planning—and if they have little to no faith in government or employers providing either for them—thoughtful employers and marketers will tailor their offers accordingly, at least until Millennials reach late middle age. Today, mass peer-to-peer recognition can be facilitated in community, social or work settings. In the consumer world, most buyers, and especially Millennials, are already adept at providing feedback about what they’ve purchased or experienced. And nearly everyone today checks consumer recommendations concerning the things they might buy and the places they might visit, for example. As above, an important part of most Millennials’ natural habitat is social networking sites. Social forms of recognition, including employees congratulating and recommending one another is an obvious avenue for organizations to consider. Indeed today’s corporate network technologies (“behind-the-firewall” corporate social network platforms) have changed the entire arena of recognition. Peer-to-Peer recognition platforms typically allow an employee to recognize colleagues, and managers to recognize employees. Some are extended to include customers, suppliers, partners and other stakeholders. Most tools include functionality for employees to collect points and connect to the organization’s reward fulfillment tools. For example, an accumulation of peer-to-peer award points could make an employee eligible to choose from a menu of rewards. Most also include templates for award certificates which can be printed (eliminating the need for approvals/bureaucracy), or, be accompanied more formally by a write-up— pegged to a core competency or value—that can be added to the employee’s record. The use of peer-to-peer recognition programs has taken off since the tools were made available less than a decade ago. According to a 2013 World at Work survey, 42 percent of firms used peer-to-peer recognition as of 2012.98 The fundamental advantage online social recognition brings to organizations—even those with formal recognition programs—is that appreciation and recognition becomes an ongoing, daily activity, driven predominantly by employees recognizing other employees (as opposed to an annual, formal evaluation driven by management). In this way, organizations stand a much better chance of building a culture of recognition and to do so relatively quickly. Peer recognition might also alleviate some Millennials’ reluctance to “lean in” and trust others, as referenced above. Given tools they are most comfortable with, those that might be on the periphery of the organization can be drawn in. Experts clearly agree that the social recognition world is not a trend that will fade away. It represents, in all probability, the next-generation evolution of reward and recognition systems organizations already have in place. And in the future, social recognition platforms will prove to be the first layer or entry point into the powerful collaborative systems and social-strategy tools of tomorrow. These systems will also provide much of the massive data organizations will use to gradually tailor recognition and reward programs down to each individual. In summarizing the first two parts of this paper, most readers will conclude that there exists no consensus definition or description of the three main generations at work and in the marketplace today—at least not one to which more than a handful of experts would agree to. The values, characteristics and preferences of the generations are interspersed between them to the extent that any or all could be used to describe an individual of any age. Nor does the alternative approach—one based on life stages —offer a great deal more guidance to employers, or incentive program designers. While it is probably true that more can be predicted about a person’s needs and preferences based on their life stage than their generation, such predictions are still bound to be inaccurate much of the time. Where life stages appear to have the greatest relevance is in the consumer products and services industries. Organizations make products for expectant mothers, new parents with young children, and for older workers approaching retirement—to name just a few—just as hotels cater to single, young people seeking convenience, wifi and other amenities, or parents with children seeking the extra space of suite hotels. Nonetheless, careful attention to the general differences between the generations, filtered by life stages, is very likely worth the time and effort it takes on the part of incentive and reward program designers, depending on the types of programs they design. Program designers who provide merchandise, individual travel and reward type incentives, for example, should strive to have a broad enough catalogue of options that any person or any age can find something that appeals to them. However, as above, a solid knowledge of generational and life stage factors will help designers in fashioning optimal communications and delivery components of the program. Where incentive program design gets more sophisticated—group travel programs and offsite meetings, for example—fully tailored options cannot be provided to every participant. The choice of location, the number and duration of business meetings, the dates for an event, the rules around inviting partners and/or children, etc. can’t be mass personalized to the extent many other rewards and incentives programs can. As above, however, incentive group travel and offsite meetings can be among the most appreciated, rewarding and memorable types of recognition for all generations provided they are designed with multiple options for reward earners once they reach the destination. (Please see Appendix C for a list of ideas in designing group travel and offsite meetings to appeal to each generation). Even where gift cards and merchandise, trophies and plaques are concerned, designers who understand the generations might be careful to include tailored ways to present the award. After all, for the Boomer who values peer recognition, choosing a commemorative watch as an award from a catalogue and having it delivered by UPS might not have the same impact as if that reward were presented by a senior executive in front of that person’s team. In many cases, designers will find significant benefit in understanding the generations and life stages of program participants and those competing for the rewards or being attracted by a marketing campaign. This general understanding is also useful in daily encounters between managers and employees, or employees and customers to avoid hot buttons and to demonstrate more empathy. Even though everyone in a generation or at a particular life stage won’t want the same things, consideration of generations and life stages is likely to result in better designed incentives, reward and recognition programs. Wherever possible and practicable, of course, designers should seek an understanding of how each and every individual employee or consumer is engaged and motivated. And though this might be next to impossible today, the ability to understand and deliver to individual preferences is on the very near-term horizon. Large organizations generate many petabytes of data each day.99 This “digital exhaust” has the potential to provide invaluable insight into workforce productivity, information flow, innovation, collaboration, competencies and preferences where rewards and recognition are concerned. In the retail world, data mining and predictive analytics already provide near unlimited consumer choice and customization. The world, especially for consumers, is becoming more and more individualized, and our experiences as consumers, particularly on the Web, are shaping expectations of what we should encounter at work. Indeed, the trend toward mass personalization is now taking hold in the workplace. Employees who have had plenty of choice in how they design their benefits packages, for example, are now also benefiting from the attention of employers who are often advised to develop, engage and retain their employees on a “one-to-one” basis,101 regardless of the size of the organization. – Ben Waber, Sociometric Solutions and author of People Analytics. The emerging field of workforce predictive analytics promises to capture the terabytes of information each of us generate each day and turn it into actionable insights about the workforce as a whole and each individual within it. As USC professor John Boudreau puts it “This is like running the robot loose in the data and letting it start learning synoptically about what keywords go together and what pings. Without a doubt, we are entering a new era in which the possibilities presented by data analysis are only constrained by our imaginations. As “People Analytics” author Ben Waber puts it, the “power of analytics [provides] a nearly superhuman ability to understand and change the world around us.”105 In the years ahead, predictive analytics will present opportunities that no one has yet forecast. In situations where employers or providers are able to deliver rewards and incentives tailored to the individual, they should. Where individual preferences and motivators can be learned, there is no need to be concerned with factors related to age, generation or life-stage. Rewards and incentives designed to demographic categories represent, more or less, educated guesswork that pales in comparison to analysis of the ambient data that can target consumers and employees by their actual behaviors. In other words, would you rather know what motivates an employee or customer based on their actual behavior, or guess what motivates them based on their age or generational cohort? In many situations, however, mass personalization is not possible. Incentive travel programs, for example, feature one destination. Designers who understand their workforce demographics and who have a good handle on the broad differences between the generations can and should combine that information with insights into the life stages of employees. This knowledge and insight might assist them in selecting the best possible venue, the right dates and schedules, and to design a range of activity options to create an incentive travel program that has the best chance at appealing to everyone who stands a chance to earn the reward. The best way to approach incentive, reward and recognition program design may be to adopt a multi-dimensional view—a set of lenses, as one of our expert interviewers put it—that considers both generational and life-stage preferences before a program is finalized and communicated. The Framework for Designing Recognition, Rewards and Incentives Programs, illustrated below in Figure Four, was built on that notion by summarizing the majority views and opinions of the experts reviewed and interviewed for this research. Though far from perfect, it can be used as a rough guide in designing a program that considers and balances the preferences of virtually every person in any organization. Understanding the broad demographics of you workforce or customer base might require only modest effort. Human Resources Information Systems (HRIS) or personnel spreadsheets probably capture the age of employees and years-to- retirement eligibility, for example. Simple demographic reports can probably be generated in minutes. Knowing how the workforce breaks down by generations, combined with a good knowledge of the general differences between the generations, can make designers more effective in creating incentive programs and in engaging employees and customers on a day-to-day basis. Effective managers can combine this information with what they know about the life stage in which each of their employees resides, bringing even more clarity to the design of incentives for example. Ultimately, in the not too distant future, most organizations will tailor most, if not all incentives, rewards, and marketing messages to each and every individual they hope to engage. For now, it remains worthwhile to understand the generational research, including life-stages, if mainly to ensure that important considerations are not overlooked. Vox Mobile is a successful 150 person, Cleveland-based “enterprise mobility” provider approaching its first full decade in business. Its CEO, Kris Snyder, doesn’t believe in treating all of his employees the same. He recognizes that although most of his employees are young (Millennials) he also has a good number of people in their mid 30’s and older who are not necessary motivated by the same incentives, rewards and benefits. Snyder and his team have designed a range of benefits—from paid-for LinkedIn accounts to matching 401(k) contributions—to ensure choice and to improve the likelihood that any employee, no matter their age or life-stage can find something motivating in the incentives and benefits packages Vox provides. The City of Claremont in California is a municipal government organization that takes differentiated benefits and rewards very seriously. The City has analyzed the motivational differences between Boomers and Gen X and Millennials to develop a suite of rewards, incentives and recognition that appeals to all. Those incentives aimed at Boomers include a two week paid sabbatical on reaching ten years of service. The sabbatical time can be combined with annual leave to extend the break to a month or more. When an employee has fourteen years of service, he or she is awarded an extra week of annual leave, at which point, the employee has a total of four weeks vacation each year. Starting at an employee’s third year of service, the City allows them to defer a part of their compensation into a savings account. The city matches up to 5 percent of an employee’s pay once they reach their tenth anniversary. The City of Claremont offers all employees a stipend of $200/year for fitness and health programs and operates a casual worker program that lets retirees return for special paid assignments with the City. Aimed at Millennials and Gen X are a dozen programs, including remote work options, a cafeteria-style benefits program, leadership training, mentoring, stretch assignments, a recognition program tied to various levels of gift cards and a peer-to peer recognition program involving cash bonuses. After one year of service, all employees receive three weeks vacation and every employee has access to a comprehensive intranet site and bulleting board system. DeAnne Aguirre, leader of Booz Allen’s organization and change management practice is an especially valued member of the firm. Her needs over her career have caused her to ramp her career up and down at least eight times. None of this has limited her career (at one point, she was the highest ranking woman in Booz’s history) but after looking into a problem the firm was experiencing with retention in the mid-2000’s, she realized that her experience should be turned into an official program. Booz’s flex-career programs now allow for consultants in “extreme” positions— those involving near constant travel, for example, to step back, go part-time or even quit the firm without losing their place. Everyone at Intel throughout the US and Canada gets a fully paid eight week sabbatical with benefits after seven full-time years with the company. Employees earn additional eight-week sabbaticals for every seven years they serve. because they know their turn will come too, if it hasn’t already. new lines to attract Millennial travelers. Intercontinental calls their new chain, “Citizen M.” Radisson has named theirs “Red,” and Marriott, “Moxy.” In each case, designers fill the hotels with what they believe will attract young travelers and cause them to spend more money during their stay. At this stage it is too early to tell whether hotels that cater to specific generations will succeed and/or whether those hotels will attract an outsize share of the traveling cohort they seek. Each time you go shopping, you might be sharing valuable “ambient” data with retailers. The term ambient is used because you are not deliberately providing this information, rather it is collected as you shop. The data can be processed and analyzed to gain insights into your preferences—including what you like, what you need, which coupons are most likely to get your attention, and, bottom line, what will incentivize you to buy more. Target data-mines shopping patterns and uses powerful algorithms to draw correlations (connect the dots) between things that might make little or no sense at first. Because data storage has become inexpensive just as computing power has increased exponentially, Target and other retailers (or employers, for that matter) can test every conceivable connection to look for clues. Target knows, for example, that many people buy certain lotions, but when the system drew a much stronger connection to shoppers who were also on the Target baby registry, analysts’ interest was peaked. It turns out that pregnant women turn to unscented, non-allergenic lotions around the beginning of their second trimester. Other analysis revealed that pregnant women in their first 20 weeks, purchase unusual amounts of supplements like calcium, magnesium and zinc. And, as they start buying scent-free soap and large bags of cotton balls, hand sanitizers and washcloths, Target knows they could be getting close to their delivery date. Analysts at Target assign a “pregnancy prediction” score and use that information to mail special offers and coupons aimed at women who are pregnant. This is a good example of aiming products and incentives at people in certain life stages and we’re bound to see more and more of it as consumers and eventually, as employees. Almost every major retailer, from grocery chains to investment banks to the U.S. Postal Service, has a “predictive analytics” department devoted to understanding not just consumers’ shopping habits but also their personal habits, so as to more efficiently market to them. Within a few years, “people analytics” departments, which Google is famous for, will be commonplace in organizations that wish to learn more about each employee on a one-to-one basis. Discussion of the concept of “generations” appears to have begun in the 19th century when Emile Littré said a generation is "all men living more or less at the same time".113 This definition evolved afterward to mean groups of living individuals who were born into the same period. Yet, Manheim’s research is anything but empirical, he conducted no surveys and relied very little on direct observation. Over the past decade or so, a good deal of analysis, involving hundreds of thousands of subjects has mostly failed to support Manheim’s claims—at least to a degree that a skeptic would deem significant enough to warrant the development of special programs aimed at generations. At the dinners, I always do assigned seating so Boomers and Millenials are sitting together rather than with their friends. Include cross-generational team building events and a wider choice of activities and content sessions. Include ice breaker activities that everyone participates in, and a hospitality suite to promote group interaction. The best tool for me is ensuring I pick a destination that has a variety of activities—a simple golf & spa destination doesn't work, especially if it's remote. I try to find a destination that can accommodate a variety of interests within close proximity to the hotel/resort. Include outside team activities—scavenger hunts/ treasure hunts/ races, etc. so that all are involved and everyone contributes—help them get to know each other socially. Build consensus through marketing communications that appeal to all generations and select locations that appeal to everyone. Always try to have a couple of breakouts that are specific to each generation so they don't feel bored. With activities, make sure they run the full gamut, from surfing to shopping. This year we are allowing a room and activities credit so that each guest can select their own activity/spa choice instead of one group activity. Offer optional activities that appeal to different generations. There is usually some crossover but it works as there tends to be higher satisfaction rates after programs. For evening functions, consider VIP after parties for younger crowds and a chillout traditional pub area for the older generation. Make GoPro cameras available to each guest for the duration of the trip with the learning lab included (for those who don't know how to use it). Create different focus areas, we had a jazz corner near the bar and a funky DJ at the pool. Different interests were easily provided for.